Atmos, a.k.a. Marak Russen of Xanthu. Created by Paul Levitz and Greg Larocque. Atmos was a minor character in original Legion continuity, and again in reboot Legion continuity. He's supposed to be one of the major superheroes of Xanthu; he was their planetary champion in original continuity and one of the Uncanny Amazers in the reboot. His tenure as a Legionnaire covered a couple of weeks in the Five Year Gap during which he didn't do anything interesting. Atmos's powers were poorly defined; he could fly, had some kind of control over atomic forces, and could also dominate people's wills. These articles are intended to show how all the different Legionnaires were great characters, and what moments showed them at their best. Well, Atmos wasn't a great character and didn't have a signature moment. Basically Atmos was a tool. He thought he was all that and a Fotomat, he had no concept of teamwork, he raped Dream Girl and he had no armpits. He hasn't shown up in the threeboot and I hope he never appears in a comic book again. 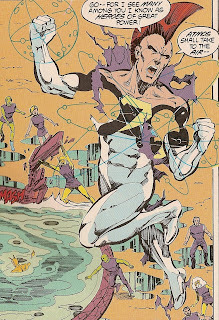 When Atmos was first introduced in the Universo storyline, I was thinking that he would be the Legion's version of Captain Atom. I actually hoped that he would join the Legion and prove to be a valuable member. That opinion changed with the more appearances he made, until I was finally ready to see Nura violate the Code and end his miserable life. Did he die in the original continuity? Actually, now that you mention it, I think he might have. He might have been one of those people the Dominators had locked up in underground vats, and who got killed when everything blew up. See ya, wouldn't want to be ya. I'm pretty sure that Atmos was killed by the B.I.O.N. unit that the Dominators created to capture the SW6 Legionnaires. Oh, yeah... B.I.O.N. I think you're right. It was the 80s. They needed someone with a mohawk. Voila - Atmos.